Home / Blogs / Do You Know Your Third-Party Risks? Do You Know Your Third-Party Risks? Brick and mortar business is a thing of the past: physical buildings and conventional employees no longer define an organization. The modern organization is an interconnected mesh of relationships and interactions that span traditional business boundaries. Over half of an organization’s ‘insiders’ are no longer traditional employees. Insiders now include suppliers, vendors, outsourcers, service providers, contractors, subcontractors, consultants, temporary workers, agents, brokers, dealers, intermediaries, and more. Complexity grows as these interconnected relationships, processes, and systems nest themselves in layers of subcontracting and suppliers. In this context, organizations struggle to adequately govern risk in third-party business relationships. Third-party problems are the organization’s problems that directly impact brand, reputation, compliance, strategy, and risk to the organization. Risk and compliance challenges do not stop at traditional organizational boundaries as organizations bear the responsibility of the actions or inactions of their extended third-party relationships. An organization can face reputational and economic disaster by establishing or maintaining the wrong business relationships, or by allowing good business relationships to sour because of poor governance and risk management. When questions of business practice, ethics, safety, quality, human rights, corruption, security, and the environment arise, the organization is held accountable, and it must ensure that third-parties behave appropriately. There are particular challenges of managing bribery and corruption, social accountability, international labor standards, human rights, information security, privacy, quality, environmental, health and safety, and more across the organizations. Growing regulatory pressures from things like US FCPA, UK Bribery Act, UK Modern Slavery Act, US Conflict Minerals, EU Conflict Minerals, California Transparency in Supply Chains Act, PCI DSS, OCC Requirements, HIPAA, and much more all put pressure on third party risk management. Growing risk and regulatory concerns with inadequate resources. Organizations are facing a barrage of growing regulatory requirements and expanding geo-political risks around the world. 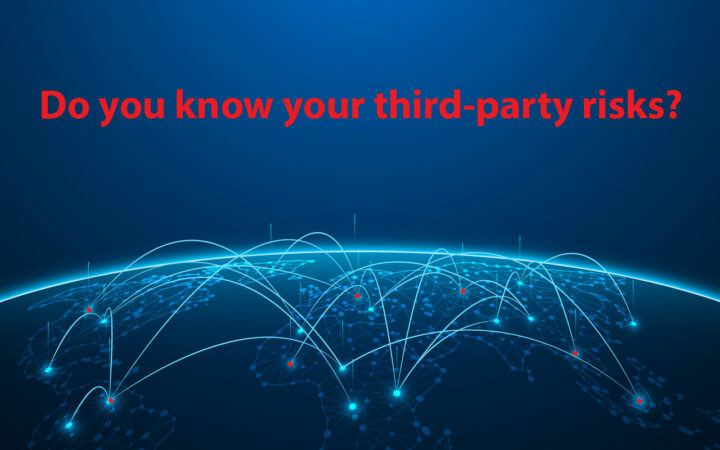 Many target third party relationships specifically, while others require compliance without specifically addressing the context of third parties. Organizations are, in turn, encumbered with inadequate resources to monitor risk and regulations impacting third-party relationships and often react to similar requirements without collaborating with other departments which increases redundancy and inefficiency. Interconnected third-party risks that are not visible. The organization’s risk exposure across third-party relationships is growing increasingly interconnected. An exposure in one area may seem minor but when factored into other exposures in the same relationship (or others) the result can be significant. Organization often lack an integrated and thorough understanding of the interconnectedness of performance, risk management, and compliance of third parties. Silos of third party oversight. Allowing different departments to go about third-party management without coordination, collaboration, consistent processes, information, and approach leads to inefficiency, ineffectiveness, and lack of agility. This is exacerbated when organizations fail to define responsibilities for third-party oversight and the organization breeds an anarchy approach to third-party management leading to the unfortunate situation of the organization having no end-to-end visibility and governance of third-party relationships. Document, spreadsheet, and email centric approaches. When organizations govern third-party relationships in a maze of documents, spreadsheets, and emails it is easy for things to get overlooked and buried in mountains of data that is difficult to maintain, aggregate, and report on. There is no single source-of-truth on the relationship and it becomes difficult, if not impossible, to get a comprehensive, accurate, and current-state analysis of a third-party. To accomplish this requires a tremendous amount of staff time and resources to consolidate information, analyze, and report on third-party information. When things go wrong, audit trails are non-existent or are easily covered up and manipulated as they lack a robust audit trail of who did what, when, how, and why. Scattered and non-integrated technologies. When different parts of the organization use different approaches for on-boarding and managing third-parties; the organization can never see the big picture. This leads to a significant amount of redundancy and encumbers the organization when it needs to be agile. Due diligence done haphazardly or only during on-boarding. Risk and compliance issues identified through an initial due diligence process are often only analyzed during the on-boarding process to validate third-parties. This approach fails to recognize that additional risk and compliance exposure is incurred over the life of the third-party relationship and that due diligence needs to be conducted on a continual basis. Inadequate processes to monitor changing relationships. Organizations are in a constant state of flux. Governing third-party relationships is cumbersome in the context of constantly changing regulations, risks, processes, relationships, employees, processes, suppliers, strategy, and more. The organization must monitor the span of regulatory, geo-political, commodity, economic, and operational risks across the globe in context of its third-party relationships. Just as much as the organization itself is changing, each of the organization’s third parties is changing introducing further risk exposure. Third-party performance evaluations that neglect risk and compliance. Metrics and measurements of third-parties often fail to properly encompass risk and compliance indicators. Too often metrics from service level agreements (SLAs) focus on delivery of products and services by the third-party but do not include monitoring of risks, particularly compliance and ethical considerations. What are your thoughts and concerns on third party management? Please post your comments below. If you have a question on third party management best practices or solutions in the market, please submit an inquiry.